When your name is "Lo Wang," you pretty much have to roll with it. 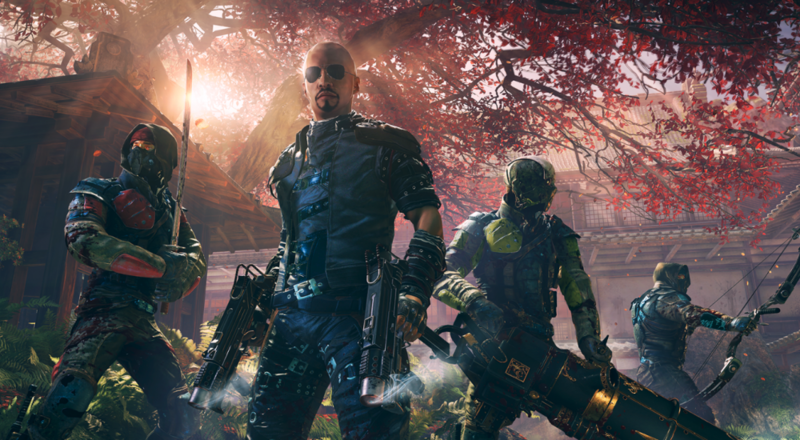 The foul-mouthed hero of Shadow Warrior returns in Shadow Warrior 2, due out sometime in 2016 for PC, PS4, and Xbox One. In addition to a slew of new features, weapons, enemies, and locations, SW2 introduces four player co-op to the mix, giving Wang three future-ninjas to kick it with. You and your companions can endure all of the painfully awkward comedy scraped straight from the bottom of the chuckle barrel. Take a look at the trailer. I think you'll see what I mean. Yeah, that sounds about right for Shadow Warrior. I see we still haven't grown past the Duke Nukem era. Come on, Wang! You've been at this since 1997. You can't get by on profanity and dong jokes for your entire career! Luckily, the new features introduced in this installment might actually make up for the amount of groaning you'll be directing towards the comedy. Most FPSs have you running around the same corridors wasting the same fools time and time again. SW2, however, shakes this up by introducing procedurally generated levels, meaning no two playthroughs will be the same. Combine this with your ninja posse, and a brutal new damage system and you've got the potential for infinite fun carving demons into itty bitty chunks. I'm not sure how many wang jokes I can endure through one game, but color me interested! We'll see where Wang's bullet and entrail strewn path leads in the coming months. Page created in 0.4771 seconds.